Ciaran Kilkenny wasn’t giving too much away about his duel with Lee Keegan. PERHAPS UNDERSTANDABLY, ALL-IRELAND winner Ciaran Kilkenny has no regrets over the black card which saw him removed from the field of play during the dying seconds of Dublin’s victory over Mayo. Labelled Dublin’s ‘point guard’ in the lead-up to Sunday and considered an integral component of their attack, Kilkenny was limited to just eight possessions by marker Lee Keegan compared to his 66 in last month’s semi-final victory over Tyrone. Given he’s an ambassador for Sure, the Official Statistics Partner of the GAA, and generally fascinated by the statistical element of his sport, it was a fact not lost on Kilkenny, who paid his respects to the 2016 Player of the Year in conversation with the assembled media. “Yeah, I did my role for the team. Like, if he was giving me extra attention, I go into different spaces and release that. So that was my role. “That’s what happens, he’s a brilliant footballer, he’s a great player, he’s achieved a lot. Yeah. He’s a great footballer, he’s a very passionate Mayo man. I have a lot of respect for him. At the end of day we all love our county so much, I have such massive respect for that Mayo team and the work they put in for their county. We have a great rivalry but we have massive respect for each other as well. Kilkenny was speaking at Croke Park as part of Sure's 'Never More Sure' campaign. Of course, while it could be discerned that Keegan kept Kilkenny quiet, the reverse was also true – Keegan’s goal notwithstanding. Kilkenny, however, wasn’t initially willing to discuss their duel in any great detail. “I expected it, yeah,” was his response when asked if he was surprised when Keegan trotted over to pick him up at the start of the game. “Yeah,” was his reply when subsequently asked if he had prepared for that scenario. The Castleknock centre-forward is eventually coaxed into elaborating. “I’ve always said they have such great styles, in terms of they have a good kick-passing game but their biggest threat is their runners. So that was a massive part for us leading up to the game, to mark their runners and make sure we can look after that for the team. I think there was a stat there, 48% of their scores come from their defence, so we knew that was a massive challenge for us as a forward unit as well, so we put a lot of emphasis on that. Kilkenny declined to reveal on-record what he did to receive a black card in the dying embers of another titanic tussle between the two counties, but in spite of widespread criticism for the game’s climax – a GPS-flinging, jersey-tugging, rugby-tackling finish to what was otherwise an utter classic – the 24-year-old was keen to stress that he regretted nothing. “No, not at all. It was the 75th minute. David Clarke is incredible on the kick-outs, getting them off short. He’s incredible. So what I did, I thought was the best decision for the team at that moment. At the end of you do, any man is willing to do what he can for his county. 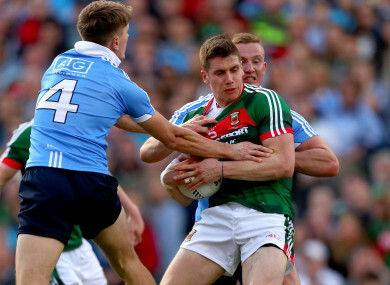 If you were there in the last minute of an All-Ireland final, what would you do? That’s every player’s thought process. As Kilkenny sees it, the same applies to his marker, whose shenanigans with a GPS unit as Dean Rock began his run-up for the winning score might have been more controversial had they altered the result. So, what was the story with Dublin’s ‘B’ team beating their ‘A’ equivalent the weekend before Sunday’s completion of the three-in-a-row? “Who said that?” asks Kilkenny in reply. It was, of course, his team-mate and five-time All-Ireland winner James McCarthy, on the wrong end of a one-point ‘clipping’, as he put it, who had let the supposed state secret slip. Monday, for what it’s worth. “Yeah, that’s it,” Kilkenny says. “The competition for places there… At the end of the day, there’s 36 players in the panel that push each other so hard for the last couple of weeks. The Never More Sure campaign inspires the GAA community to have the confidence to prepare for the uncontrollables in the world of sport. Sure is the Official Statistics Partner of the GAA. Email “'If you were in the last minute of an All-Ireland, what would you do?' - Kilkenny discusses black card”. Feedback on “'If you were in the last minute of an All-Ireland, what would you do?' - Kilkenny discusses black card”.